I'm confused on how to handle navigation inside tabs in iPhone. Once the post is created, does it belong in the create tab? If it doesn't, how an 'orphan' page should behave in iPhone, should I still show the tabs but no tab is selected? In this example I can't have a back button because the post has been created, but in a case of a navigation within a tab, does the tab remain selected? Let's say I click Category > List of items > Item (which could have been reach from any other tab): the category tab remain selected and the back button added to each screen? 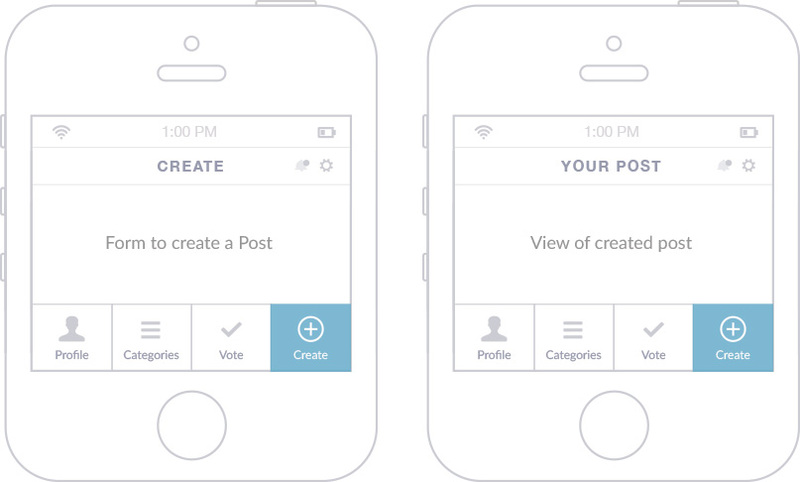 I think part of the problem with this example is that creating a post, which is a mode, is actually being presented in the same way as the list of categories, which is a view or a 'place' within the app. This means that after creating a post, there is no natural 'place' for the user to be returned to. If all of the existing posts live inside the 'Categories' section, I would rename that tab "Posts", remove the 'Create' tab and replace it with a 'Create' button inside the posts tab. That way, the user will go into the Posts tab to create a post and stay in that section afterwards. Not the answer you're looking for? Browse other questions tagged navigation iphone tabs or ask your own question. Is it OK to have a global navigation tab link to another site?